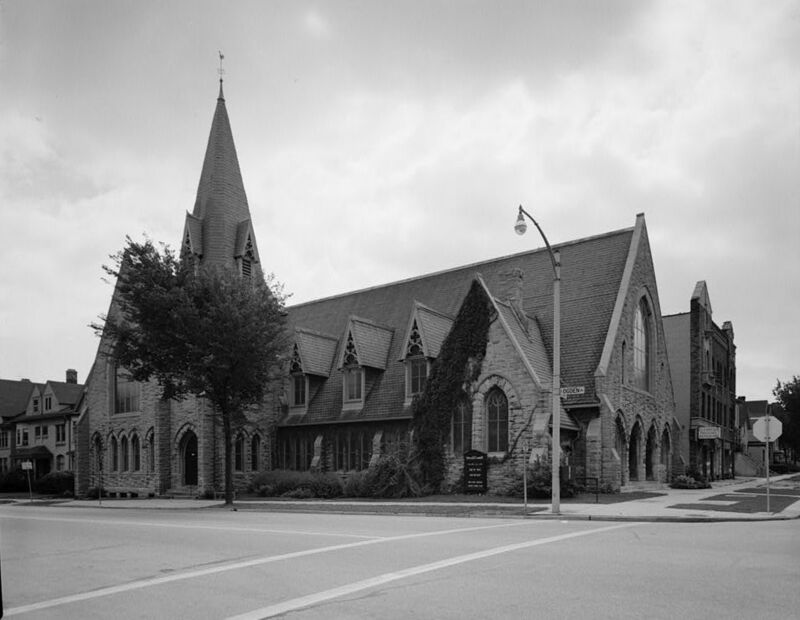 Unitarianism in Milwaukee dates to 1842 when a contingent of liberal Christians gathered to hear a visiting preacher and proceeded to form the First Unitarian Society of Milwaukee. Approximately forty members began meeting in the old city courthouse, and soon erected a church and secured a permanent minister from Massachusetts. As liberal Protestants who privileged individual reason over received doctrine, these Unitarians were optimistic about their prospects in Milwaukee, viewing the city as one where “frequent collisions of opinion” had eroded “religious prejudices, bigotry and intolerance” in favor of “freedom of thought” (such were words of William A. Prentiss, an early society member and later city mayor). Despite such early boosterism, enthusiasm waned and the church building was sold under foreclosure in 1849. Yet interest rebounded in 1856 when William Greenleaf Eliot of the Western Unitarian Conference donated $500 for a church building, sparking donations up to $6,500. The resulting structure was completed in 1857 and the Society incorporated in 1859. Staunchly anti-slavery, Milwaukee’s Unitarians embraced the Union cause during the Civil War and freedmen’s aid efforts after emancipation. In 1864 there were more than eighty associated families, although persistent turnover of ministers led to a temporary closure between 1872 and 1875. This was in spite of leadership by some of the city’s wealthiest citizens, including shoe manufacturer William H. Metcalf, prominent industrialist Edward P. Allis, and bank president C. F. Ilsley. Such patronage sustained the society’s finances. In May 1892, members occupied a new building worth over $40,000, with substantial donations from the Metcalf family. This refined congregation prioritized artistic and educational philanthropy. Yet the church’s social conscience increasingly defined its mission. In 1892, a chronicler lauded the society’s early commitment to “scientific charity,” a systematic approach to social reform that differed from a focus on individual sins. The society was an early benefactor of an orphanage and soup house, and went on to donate to the Wisconsin Humane Society, the Children’s Free Hospital, and the Protestant Home for the Aged. This attention to social ethics extended to racial inequality. The society hosted Booker T. Washington in 1896, and Urban League President and Unitarian Whitney M. Young, Jr. during the Civil Rights Movement. During the late-twentieth century, Unitarian activism would focus on civil rights, poverty, and antiwar protest as part of a broad commitment to peace and justice. While never on common theological ground with conservative Protestants—in 1856, Milwaukee’s Presbyterians refused to sell their church to their unorthodox neighbors—the denomination has evolved away from its broadly Christian roots, aligning with the Universalist Church in 1961 and today affirming the ultimate authority of individual conscience over religious doctrine. Unitarian-Universalist churches welcome people from all faiths as well as secular humanists who are committed to spiritual exploration and an active social justice ethic. At the moment, there are four Unitarian-Universalist communities in the greater Milwaukee area: Unitarian Universalist Church West (Brookfield, established in 1961); Unitarian Church North (Mequon, established in 1962); United Unitarian (Waukesha, transplanted from Mukwonago in 2012); and the First Unitarian Society that still occupies its historic 1892 church. ^ First Unitarian Society of Milwaukee (Milwaukee, WI), The First Unitarian Society of Milwaukee: Centenary (Milwaukee, WI: The First Unitarian Society of Milwaukee, 1942); First Unitarian Society of Milwaukee (Milwaukee, WI), Historical Sketch of the First Unitarian Church of Milwaukee (Milwaukee: King, Fowle & Co., 1892). ^ First Unitarian Society, Historical Sketch; Laura Rominger, “‘To Belong to This Church Was an Introduction into “Best Society”’: Elite Values and Liberal Christianity in Milwaukee’s First Unitarian Society, 1857-1894,” Milwaukee History 26 (Fall-Winter 2003): 52-65. ^ Rominger, “‘To Belong to This Church Was an Introduction into ‘Best Society’”; Rev. Andrew C. Kennedy of the First Unitarian Society of Milwaukee, “The First Church Story,” unpublished paper, http://www.uumilwaukee.org/sites/default/Files/sunday_services/Past_sermons/FirstChurchStory-2006.pdf, accessed July 17, 2015, 5. ^ Kennedy, “The First Church Story,” 3, 5, 6.